Made from real, high-quality potatoes. Making great mashed potatoes can take a lot of time and effort. 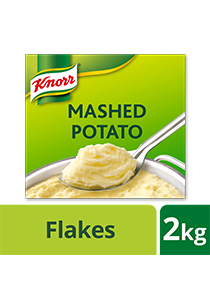 Knorr Mashed Potato helps you create perfectly silky mashed potatoes in 5 minutes. Make great tasting mashed potatoes in 5 mins! Boil 9 liters of water with 70g salt. Add 4 liters of cold water (or milk). Do not exceed temperature of 85 degrees. Briskly stir in 2kg potato flakes with a wired whisk. Stir briefly again after 2 to 3 minutes until smooth.